My first 392 Hemi came in the year 1986. I was lucky that day to stumble upon Ten 392 Hemi Engines. A man named Roy Shockley that lived over in Orange City, Florida had a yard full. I received a tip that he had them, so I immediately drove over to his house and I couldn't believe my eyes. He live on about an acre of land. And at the end of a dirt road before you dead end into the railroad tracks sat a little house. The house was run down. Unsuitable for living. When I drove up I didn't see anything. After calling out his name, I heard a man yell out "I'm over here". I asked about the engines and he replied, " they are out back". When we went around the corner, I started seeing them. I turned and said, "I'll be right back". I went home for a friend and his trailer. When we went back we pulled everyone, but one, a 1955 270 Red Ram Hemi, out of his yard. I bought them for as little as $50.00 and as much as $500.00 each. When we got back to town people were following us because they knew what they were and they wanted them. Within two hours of being home, I sold six of them just as they were off the trailer. 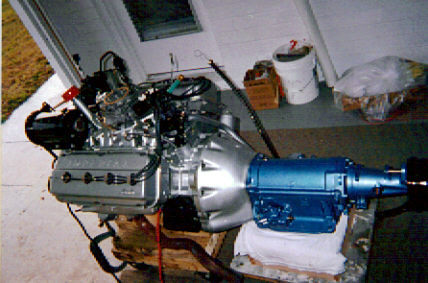 I rebuilt three of these Hemi Engines to stock specifications and sold them at the Daytona Turkey Rod Run in 1994. My Dodge Challenger received the one from the 1958 New Yorker. These were my first attempts at the earlier style Hemi Engines. At first, I found them to be very easy to rebuild. They were less problematic compared to the late style Hemi Engines. I build Hemi engines. My eleventh 392 Hemi came in the year 1988. I heard that a local salvage yard had one. I drove over and listened to it run in the car. It was a 1958 Imperial. I bought it that day. That weekend I took the Hemi out of the car. This was a totally untouched engine. My mission was to restore it to its original factory condition. In six months I turned it around and sold it to a girl in Oregon for her father's car . Perfectly restored to museum quality. I build Hemi engines. My twelfth 392 Hemi came the year 1989. 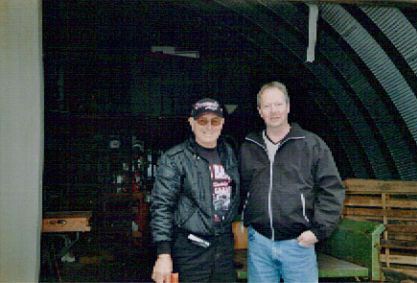 I drove over to Ocala, Florida and bought it from Don Garlits. Currently this engine is under a first for me! Being Supercharged. This engine received the grand treatment. Block was bored .030 over, align honed and decked for correctness. The heads received the complete valve job in icluding new hardened seats. Crane Cams provided the hydraulic Camshaft. 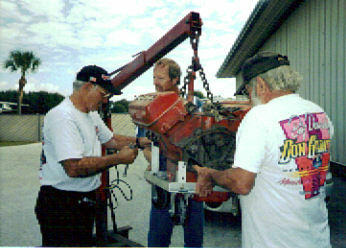 The blower shop provided the Blower with 50 percent underdrive. This was a fantastic project. The thrill that everyone received when it came to life. 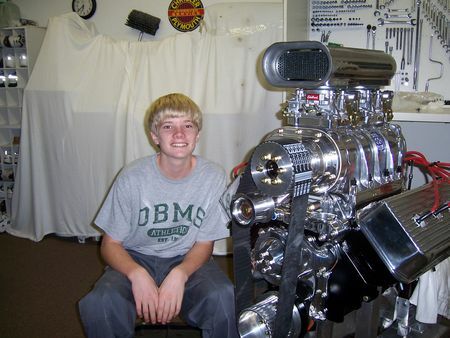 I build blown Hemi engines. Lately the numbers grow and does the complicity of the projects including electronic fuel injection. I have been building these EFI Hemi engines and find them to be reliable and the only way to go. 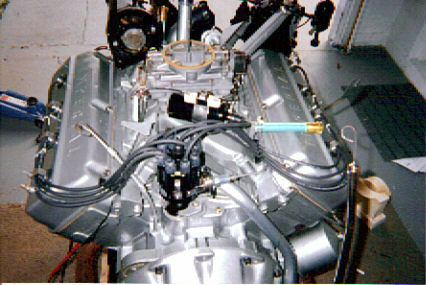 392 Hemi Engine - photo taken in 1994.